Nokia has launched the Lumia 800, the flagship Windows Mobile smartphone it hopes will revive its fortunes in the mobile market. 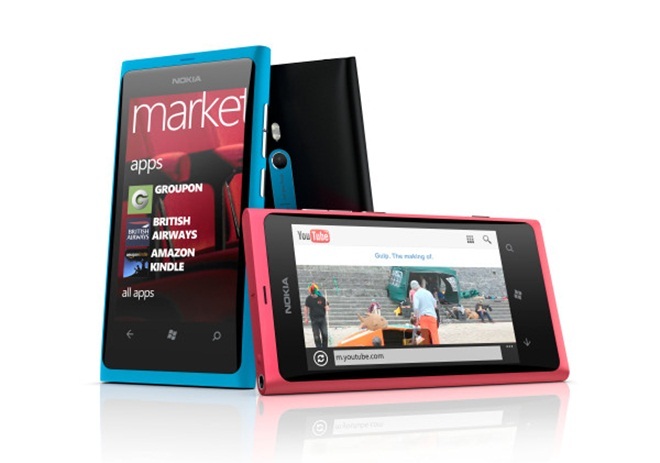 The device, which was unveiled at Nokia World alongside its little brother – the Lumia 710, is available in magenta, black and cyan and has been designed based closely on the company’s N9 device, which it greatly resembles. Click here for our hands-on coverage of the Lumia 800. Nokia is describing the Lumia devices as “stylish and smart” and both devices include support for Nokia Maps, and a range of co-branded accessories with Monster. The device is priced at 420 Euros and Nokia is already shipping and will launch in France, Germany, Italy, Netherlands, Spain and UK in November. Nokia revealed that it is planning to introduced the Lumia 800 in Hong Kong, India, Russia, Singapore before the end of the year with other markets likely in 2012. Both Lumia devices are available to preorder at Nokia.com today. “There is a harmony to the device”, said Nokia CEO Stephen Elop who announced the device at the show calling it “the first real Windows Phone”. Nokia’s Kevin Shields went on to showcase more of the Lumia 800 calling it as “a beauty on the outside, beast on the inside”. The Lumia 800 includes Nokia Drive, the company’s voice-guided, turn-by-turn navigation system which is pre-installed on the Lumia 800 for free, making it the only Windows Phone to enjoy the feature which is demonstrated in the video below. The device is closely linked to Nokia SkyDrive with each users allocated 25 GB of storage on the cloud storage system. While the device leans on its Windows operating system with support for the Microsoft Word suite and the Internet Explorer browser. Details of the device and the Luumia 710 and Nokia 900 were leaked online yesterday, as the Finnish manufacturer looks to the Windows Mobile operating system to help it compete with Apple, BlackBerry and Android OS manufacturers. Based on those details, weighing in at 142g, the Lumia 800 packs 512 RAM although it is reported to not feature an SD card slot which would allow additional storage. Rumours suggests that the device will provide 390 hours of power in idle mode (which goes down to 380 hours on 3G) while those using 3G can expect 5 hours of talk time, or 50 hours of music playback.